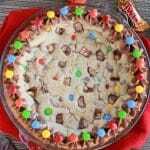 A candy bar filled cookie, baked in a pie dish and topped with chocolate frosting. A thick and soft cookie with chocolate candy in every bite. Preheat oven to 350°F. Generously grease a 9 1/2 inch pie dish and line the bottom with a round of parchment paper. Set aside. With a hand mixer or stand mixer, beat butter and sugars for several minutes, until light and fluffy. Add egg and vanilla extract, beat to combine, scraping the sides of the bowl as necessary. In a separate bowl, combine flour, cornstarch, baking soda, and salt. With the mixer on low, slowly add the the dry ingredients, mixing until combined. Using a rubber spatula or wooden spoon, stir in 1 cup of chopped candy bars. Press the dough evenly into the prepared dish. Sprinkle the remaining 1/2 cup of chopped candy bars onto the top of the dough, lightly pressing them down. Bake for 23-25 minutes, until the edges are light golden brown. Cool completely. Beat butter, cocoa powder, powdered sugar, vanilla extract, and 1 tablespoon of milk for several minutes. If necessary, add an additional tablespoon of milk to thin the frosting. Using a pastry bag with a decorating tip, pipe the frosting around the outside edge of the cooled cookie. Decorate with M & M's or chopped candy bars.